Mango Sorbet is a delicious and easy to make dessert. This is prepared with fresh mango slices, lime juice and coconut milk. The ripe mangoes natural sweetness, enhances the creamy taste and rich texture. 1. Slice the fresh mangoes and scoop out the ripe flesh from the skins. 2. Place the slices in a blender and blend well. 3. Add sugar and whip for a minute. 4. Now, delicious mango puree is ready. 5. Now add lemon juice, coconut milk and whip for few seconds. 6. Add whipping cream to the puree and continue blending. 7. Blend well, till the cream forms a stiff texture. 8. Take care the cream shouldn t be runny, it should be in a good mango cream consistency. 9. Place it in a ice cream bowl and keep it in freezer. 10. Allow to freezer for 8 hours or overnight. 11. Scoop the mango sorbets in ice cream cups. 12. Garnish with chocolate syrup, choco chips and grated nuts. Looking forward your lipsmacking ice cream recipes..! lets enjoy this summer with ice creams...!!! Hummmmmmmm.... o sabor... manga com leite de coco...delicioso!!! Delicious and easy.. Thanks for sharing.. So beautiful, love the flavor and color, it looks delicious! This looks absolutely delicious! And with that chocolate! Yum! I'm definitely going to have to get creative (or try to) with my submission to your event! Woww.. looks refreshing and tempting.. awesome clicks dear !! Thank you for the recipe. I will give it a try soon!! Awesome !! mango sorbet ice cream mouth watering one..
looks yummy and delicious dear..
mango sorbet used to be one of my favorite ice cream treats growing up!!!! yum! Thanks for your ever lovely feedback..! 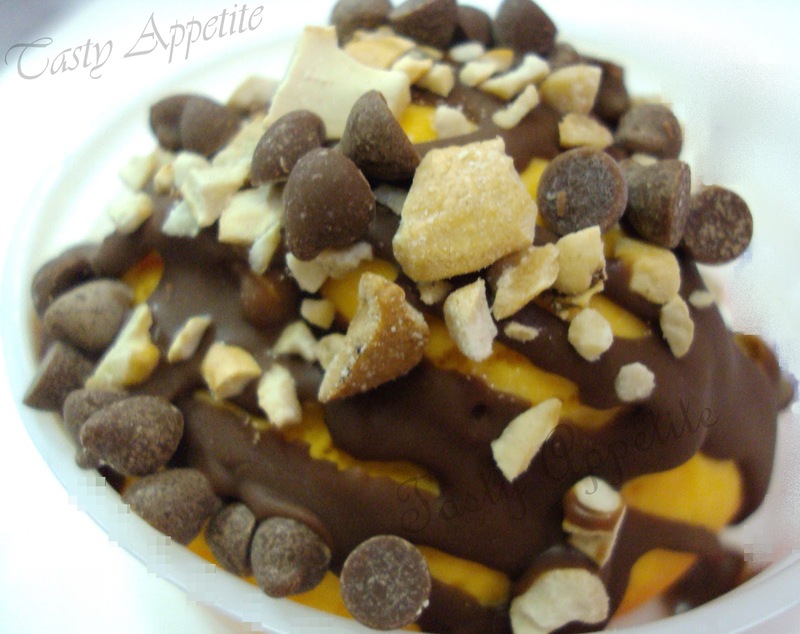 Its always wonderful to hear from you..
Super delicious and irresistible icecream..
Ice cream is s treat to the eyes. Excellent looking dessert. Super delicious and delectable! lovely and yummy... addition of coconut milk makes it thai style.. This looks so good, love the color very very vibrant. Lovely sorbet.. Looks very delicious!! All I can say is awesome,awesome and awesome. You had me at Mango! This sounds fantastic!! Mango ice cream is so fresh and yummy! What a special treat with all those toppings! Wow, Creamy and yummy looking ice cream.. Wish I could lick it no why just lick it eat the whole ice cream. Yum, can't wait to have mangoes back in season! Delicious, cooling & delectable sorbet!! Delicious and very easy. Thanks for sharing and good luck in your own event. 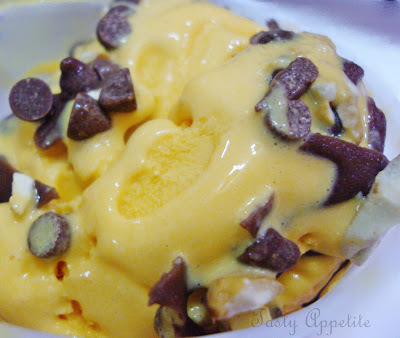 Mango Sorbet Ice Cream sounds wonderful with the nuts and choc. chips topping! Beautiful recipe ... I must try it. I'll have to try this soon...it's just so deadly tempting!! Hi Jay! this looks fantastic! I have been on the lookout for some reicpes to make in my ice cream maker lately too! Thanks for visiting my blog and following it. I am also following yours now! Jayanthy thanks for leaving your comments. This sorbet is fantastic. Even though I see your posting in face book every day this is the first time I am visiting your blog. Very nice collection of recipes. omg..Mango is my fav..Its so..tempting..send me the ice cream.. The perfect summer time frozen treat, ahhhh! i'm drooling looks so yum!